Stockholm, Sweden: 14th of June, 2010 – Today Tobii Technology AB announced its European launch of a brand new recorded speech device, the Tobii S32 Touch. Emergent communicators are given a way to communicate by activating pre-recorded messages at the touch of a finger. 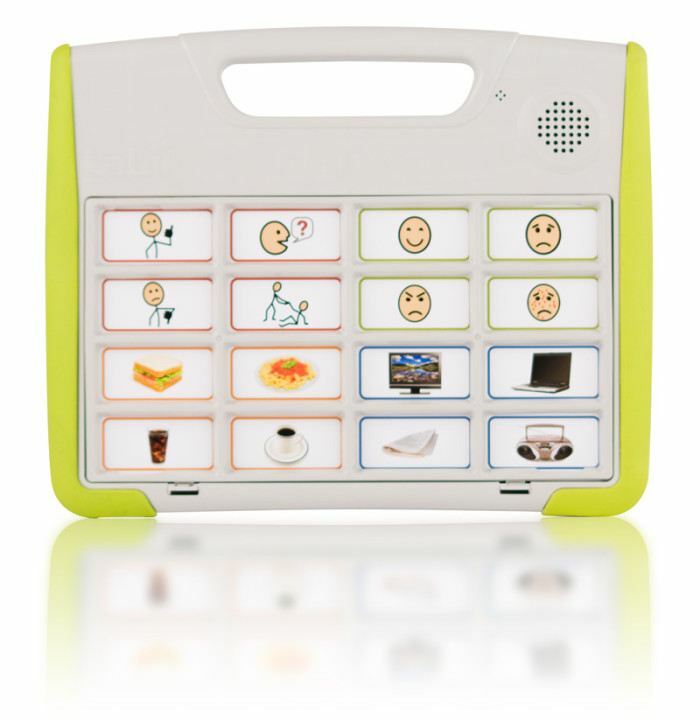 The Tobii S32 is an augmentative and alternative communication (AAC) device that plays back pre-recorded messages, sounds or IR-signals, activated simply by touching a sheet of printed symbols, pictures, or scenes. The messages and sounds are recorded either directly onto the Tobii S32 or via the accompanying software Tobii SymbolMate. Tobii SymbolMate also handles the creation and printing of page sets. The Tobii S32 comes in two different models, Touch and Scan. The Tobii S32 Touch is targeted specifically towards individuals who have the use of their hands − where the touching of the pictures and symbols is not a difficulty. The Tobii S32 Scan is a switch/scan model, made for individuals who have difficulty using their hands to touch the pictures and symbols, but instead use switches of any kind to make their choice in the grids or scenes. Tobii S32 Scan will be launched shortly. • A recording time of over 60 hours, on 192 levels, in full quality. • It runs on standard 1.5 V, size AA batteries that, depending on the battery manufacturer and usage, can last for several months or more, not days. • Lightweight and durable, designed to withstand the sometimes rough treatment children can give a device. • Great sound, to help make a child’s voice heard. • Fully integrated with Tobii SymbolMate. “We set out to design something that takes recorded speech devices to the next level. We have seen that there is room for a device that offers great sound, long recording and battery times and that can handle everyday usage that sometimes gets a little rough. To emerging communicators the Tobii S32 is a communication device that is fun and easy to use,” says Lars Lamhauge, International Product Manager of Assistive Technologies at Swedish Tobii Technology AB. For an interactive demo of the solution, please visit www.tobiis32.com or go to www.tobii.com for more information about Tobii S32 and Tobii SymbolMate. Visit www.pagesetcentral.com to download and share page sets and communication boards for free.